Click here for a larger, easier to read version. The first guest of the Holiday Hotel (1965) was a man named Jim Woodman, a travel writer for (now defunct) TAN Airlines. He returned and wrote an article about his trip for the Chicago Tribune. The article is excellen and shows what a small village San Pedro was. 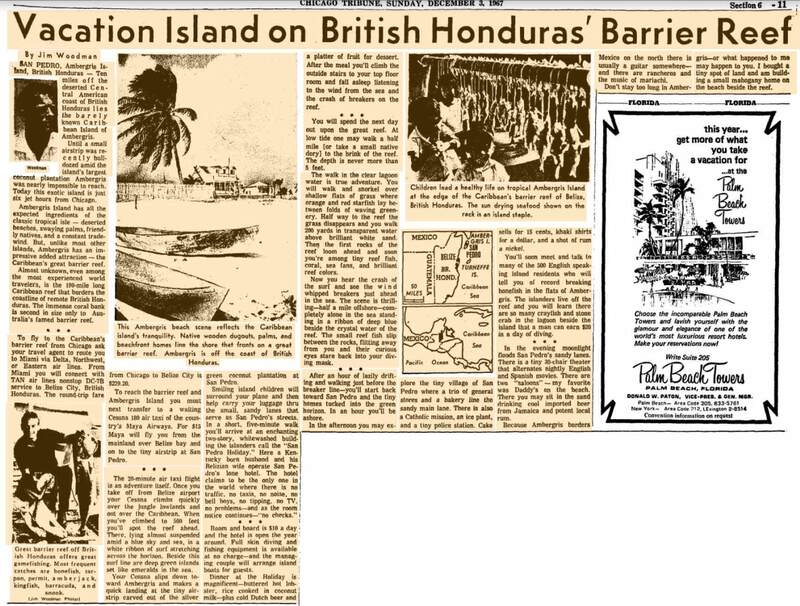 In mid-60s, the roundtrip price from Chicago to Belize City was $229.20. Reaching paradise is not always an ordeal. My flight from Miami included a	glass of wine, a fine seafood meal, an in-	flight movie and a cat nap- completed with	dreams of warm, clear water and golden	coral reefs. Two hours after I boarded it, our TACA 767 touched down at the International Airport just outside Belize City. Within one-half hour I was aboard a Tropic Air twin prop and 15 minutes later I arrived in paradise- Ambergris Caye. Ambergris should appeal to most anyone yearning for a tropical getaway. This is especially true if you are a diver searching for both exciting diving and a fun island. 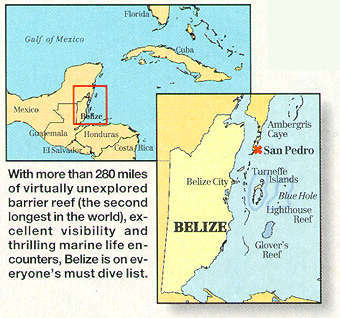 Ambergris, 25 miles long and one- half to two miles wide, is Belize's largest offshore caye. Actually, it is an island by virtue of a narrow canal, dug by the ancient Maya, that separates Ambergris from the southern end of the Yucatan Peninsula. This geographical closeness has made it convenient to the Yucatecan Maya, who migrated here from Mexico during and since the Caste War of 1861. Today, Ambergris is purely Belizean but with more than a hint of Maya-Mexican ambiance. 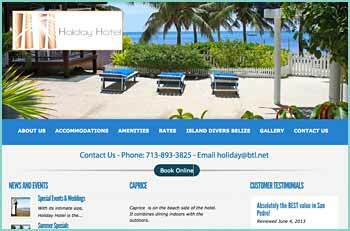 Ambergris Caye is also Belize's most populated and most popular offshore island. 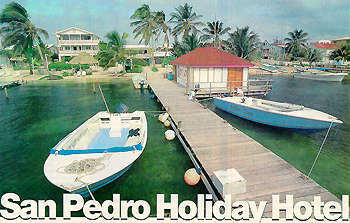 San Pedro Town, toward the southern end of Ambergris Caye, is the local and tourist hub. Lining the sandy streets bordering the eastern beaches are numerous shops, r6staurants, bars and hotels. In the center of town, on the beach, is the charming and nearly historic San Pedro Holiday Hotel. The town center does not imply traffic, noise or crowds. It is merely the middle of what is still more of a sleepy fishing village than an industrious tourist Mecca; few buildings in San Pedro are taller than a palm tree. 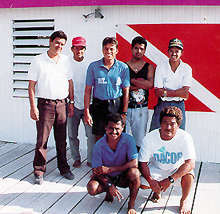 Above: Chefie Paz (left) owns and manages Holiday Hotel's dedicated dive operation, Bottom Time Divers. 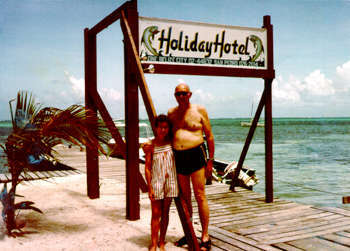 Celi Nunez McCorkle (right) opened the Holiday Hotel in 1965. Together they offer great diving with island enchantment. Celi Nunez McCorkle is an island girl by her own definition. Born and raised in San Pedro, she is also the belladonna of tourism on Ambergris Caye. Celi opened Holiday Hotel, a five room establishment, on June 16,1965: With a sing-song voice that characteristically mixes purpose with humor, Celi described those early days: "We had nada-nothing! No electricity, no water, no phones, not even an airstrip. Guests arrived by sailboat and they were picked up in a Land Rover, the island's only vehicle. We brought luggage to the hotel with a wheel barrow! " The exciting Shark-Ray Alley animal encounter. Dive tourism began on Ambergris Caye when Celi brought in the island's first compressor in 1970, a 4.5 cubic foot Mako transported in a trailer through Mexico. After the arrival of the island's hyperbaric chamber eight years ago, dive tourism accelerated rapidly and Holiday Hotel has been a focused dive resort ever since. Today Celi takes a more behind the scenes role. The day day operation is handled by another land girl, Kim Reyes, the friendly and capable resident manager. I had visited the San Pedro Holiday Hotel restaurant before and knew I could expect a relaxed, unhurried stay. This friendly place exudes island charm. Over the years it has improved in appointments and services (in fact, renovations were being completed during my visit) but not at the expense of losing its soul. Holiday Hotel looks like, feels like and is an authentic island retreat, combining modern conveniences with hospitality and a way of life that, unfortunately, is disappearing in much of the Caribbean. The hotel entrance is downtown street side, but the loveliest view is from the beach. The original building (the foundation of which was built on thousands of crushed conch shells, Celi told	me) is still visible toward the northern	end, between the main house and a guest wing. The hotel restaurant is on the first floor. The focal point is the three story main house, which houses the reception area, Sea Gal boutique, tropical lounge and social room on the first floor and guestrooms above. To the south is a cabana. 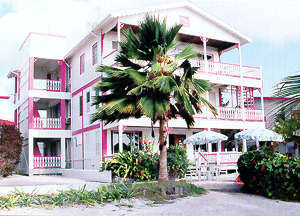 The entire hotel exterior is an accurate portrayal of Caribbean/colonial architecture, finished in pure white with gingerbread latticework and trim painted in bright fuchsia. (The pink-purple paint color is Celi's formula, mixed in Miami.) The result is a cheery island masterpiece. The courtyard is 200 feet of beachfront, combining manicured palms, seagrapes and succulents with white sugar sand. Accents include two palapas, tables, chairs and a bevy of beach chaise lounges. Gabled gateways border both ends of the beach. The hotel and grounds are cared for like a fine old estate; each morning the beach is raked and general cleaning proceeds through the day. Like the rest of the hotel, guestrooms are warm, friendly and relaxing. There are 1 rooms, including one suite, all seafront with an ocean view and furnished with one or two queen sized beds or a combination queen and one or more single beds. One modern concession is that ev- ery guestroom is air-conditioned. Or, if you prefer, there are vented windows and overhead fans. Of course, today there is electricity and hot/cold running water and drinking water in your room. But the phone is in the office, along with a fax and the only TV is barside, reserved for news and sports events. Celi's Restaurant on the beach is one- half a screened porch with sand floor and one-half a traditional dining room. The restaurant is warmed by wood and wicker, cooled by fans and accented with a ginger lily and bird of paradise flower at each table. The restaurant is open 7:00 to 10:30 am for breakfast (eggs, huevos rancheros, omelets, waffles, fruit plate, French toast, etc.) and 5:30 to 9:00 pm for dinner (lobster, crab, fish, shrimp, chicken, key lime pie, etc.). Celi's Deli, on the first floor facing the street, is open from 6:00 am to 6:00 pm daily (coffee, soft drinks, juices, sand- wiches, tacos, burritos, tostaclas, tamales, rotisserie chicken, banana bread, etc.). The Tropical Lounge, with Chico at the controls beginning at 8:00 am, is said to be the island's number one gossip spot. On the hotel dock, just a short stroll from your room, is the Holiday Hotel's dedicated dive operation, the Bottom Time Dive Shop. 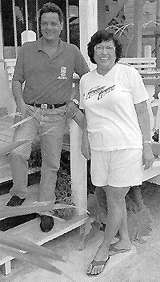 Owned and managed for the past ten years by islanders Chefie and Clara Paz, Bottom Time offers a complete menu of dive services. There are up to ten boats available, all in the 24 to 26 foot category and most equipped with a canvas top. The most popular outing is a two tank trip offered at 9:00 am and 2:00 pm. Daily single tank trips are available as is a 6:00 prn night dive-any evening with two or more divers. Snorkeling tours are also available daily at 9:00 am and 2:00 prn to destinations such as Mexico Rocks, Hol Chan Marine Park or to Shark-Ray Alley, Ambergris Caye's exciting new animal encounter. Full day snorkel tours to nearby Caye Caulker are also available. Other specialty trips include bird or Manatee watching, picnic trips, mainland river trips and general sightseeing. Bottom Time provides rental gear, general merchandise sales and PADI open water, student referral, resort or advanced courses. Arrangements can also be made for all day or overnight dive trips to Turneffe Atoll, Lighthouse Reef and the Great Blue Hole. As Chefie says, "We offer the whole enchilada." Offdiving hours at the hotel are quickly consumed with relaxation or a variety of experiences. Town or beach walks are probably the most popular and obvious activity; there are dozens of shops, restaurants and lounges within a short walk of the hotel. Holiday Hotel offers daily glassbottom boat tours aboard the Reef Seeker for non-divers. The reception desk, open from 7:00 am to 8:00 pm, is your headquarters for all travel arrangements, including reconfirmations, island tours, fishing tours and a smorgasbord of Maya sites and jungle treks on the mainland. Celi's Beach Barbecue is a traditional island party offered each Wednesday evening at 6:30 to visitors and locals alike. Pork, chicken and fish are served with flour tortillas, beans and coleslaw. The San Pedro Holiday Hotel and Bottom Time Dive shop combine great diving with true island charm. For reservations and information, contact: (800) 382-7776. In Belize call 011-501-262014; fax 011-501-26-2295. Sometimes, no matter how hard you try to keep a secret, word always seems to get out. Until now, Belize was one of those places, enjoying a lot of attention from well-informed dive travelers. Perhaps its exposure is owed to dive magazines and ecotourism groups whove discovered its rich history, culture and incredible diving. The secret's out: Belize's Ambergris (aye is an island of barefoot and breezy casualness where leisure is paramount. People come here for the sun, the fishing and, of course, the diving. The island's heart is Son Pedro, a sleepy fishing village. In what could be best described as downtown is the charming Son Pedro Holiday Hotel, complete with air-conditioned rooms and an exquisite seafood restaurant. It's the town's epicenter at happy hour, a place of unhurried comfort and hospitality-the ultimate gathering place for new acquaintances and old friends. Next to the hotel, right along the shore is the Bottom Time Dive Shop, a complete watersports center with PADI resort courses and full certification programsall owned and operated by Belizeans. Resort certification referrals through other are welcome, too. The professionals at Bottom Time Dive Shop are ecologically minded experts. They know the Ambergris waters firsthand, and that reef management is key to the success and health of Belize's pristine reefs. The Holiday Hotel is the perfect place to unwind, relax and curl up with a good book. The resort provides all the necessities: chaise lounges, towels and a long stretch of talcum-soft sand, surrounded by brilliant waters and the cooling shade of cocanut palms. Bottom Time's fleet of dive bouts are fast and comfortable, ranging in size from 22 to 60 feet. The dive fleet includes two 26-foot and two 24-foot custom dive boats powered by twin outboard motors for fast trips to sites such as Blue Hole,, Tumeffe Atoll and Lighthouse Reef. Each boat carries a maximum of eight to 10 divers and includes a divermaster and guide.. The shop usually makes a twotank dive in the morning and a two-tank dive in the afternoon. Night dives are scheduled regularly. Computers and unsupervised buddy diving are welcome, and the shop provides access for handicapped divers. The Belize Barrier Reef is the longest in the Westem Hemisphere--stretching from Mexico's Yucatan Peninsula to Honduras's Bay Islands--and begins only feet below the surface and runs perpendicular to shore in a spur-and-groove configuration. Visibility often exceeds 150 feet, mid the reef is dive with massive schools of fish, healthy coral, yellow tube sponges and iridescent lavender vase sponges. The sky's the limit for post-dive activities, which include daily fishing outings for marlin, sailfish or wahoo, as well as reef fishing for large grouper and snappers and tight tackle fishing, for tarpon. If you prefer staying closer to shore, try flat fishing for bonefish. Day tours to the mainland include visits to the Mayan ruins of Alton Ha, the Belize jungle zoo, a 1,000-foot waterfall and other exciting tours. Manatee and Bird watching trips can also be scheduled. Click here for the history of the Holiday Hotel on San Pedro Scoop.